Over the last two decades Tesco has emerged as a dominant player in the UK market and a leading global retailer. 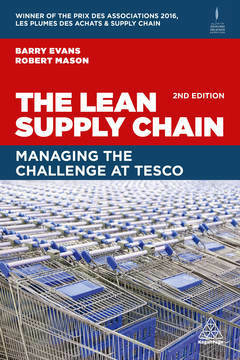 The Lean Supply Chain: 2nd Edition explores how Tesco, over the last 20 years or so, has built its business around supply chain excellence. As a mega-retailer, Tesco has learnt to create a balanced supply chain system, supporting suppliers' needs as well as customers' requirements. This perspective, and an ambition to act sustainably, has underpinned a rebuilding of trust in the Tesco brand and a resurgence in commercial fortunes. The first edition of The Lean Supply Chain was highly acclaimed, winning the prestigious Prix des Assocation 2016, in Les Plumes des Achats & Supply Chain. In this new edition, containing new chapters on Tesco's current strategy, rebuilding trust in the brand and the CSR agenda, the authors chart the principles of lean thinking, customer loyalty and simplicity which were used by Tesco to frame its supply chain strategy. They draw upon their deep knowledge of how the retailer has dealt with challenges and market changes from both academic and practitioner perspectives to provide lessons for other businesses, large or small, who wish to place how they manage their supply chains at the heart of their competitive strategy. Barry Evans has held roles in Tesco including Lean Process Manager in Tesco Supply Chain Development. He joined the Lean Enterprise Research Centre at Cardiff Business School as a Senior Research Associate. Robert Mason is a Reader in the Logistics and Operations Management section at Cardiff Business School and has led numerous business research projects, including with Tesco as a partner.